The backtest history currently show’s the number of stocks filtered per timeframe(day, minute, week..) grouped by its market cap. 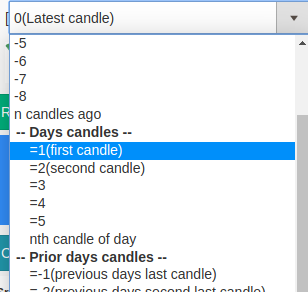 Click on the individual bars to view the list of stocks filtered on a particular day. Author AkashPosted on March 20, 2019 March 20, 2019 Categories Uncategorized43 Comments on Backtesting now available! We are happy to launch Desktop & mobile notifications for Alerts, they allow you to receive alert notifications across multiple devices (mobile/desktop) that has a modern browser installed (eg: Google Chrome/Firefox). STEP 1: Visit our site, chartink.com on your desktop/laptop. STEP 2.a: You will be prompted with a message as below, click “Allow Alerts” to proceed. If the prompt is not visible, perform the next step. Sit back and relax, we’ll show a pop-up(alert) on your computer screen once we notice new stocks are available in your screener. STEP 1: Visit our site, chartink.com on your mobile device. STEP 2.b(optional): Skip this step if you are able to see the above prompt. If not, search for the “Bell” icon at the bottom right of our site & click on it to “Subscribe” for notifications. If you facing any issues in getting these notifications work, please contact us. 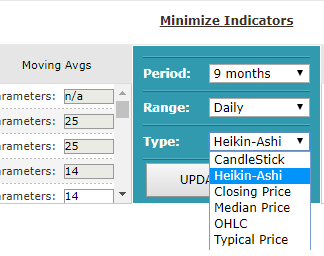 Author AkashPosted on February 12, 2018 Categories charts, scanner22 Comments on Heikin-Ashi Candlesticks Scans & Charts are now available! Open any screener for which you’d like to create a alert for and click on the “Create Alert” button(right besides the Run scan). If you still searching for good screeners, we’ll suggest you start with our top loved scans, which contain a good mix of Scans for Intraday/Swing & Short term trading. Alerts can run every 1/2/3/5/10/15/20/30/60/120/240 minutes & on daily, weekly or monthly basis. Alerts can also be configured to run at market close & open. Read our FAQ on more details on when alerts are run. SMS & Email – We also provide you with 2000 credits(1000 sms & 1000 email) monthly. These allow you receive alert notifications over sms or email. We recommend you track the notifications for the alerts you have configured for optimal usage of notification credits. At times, you may want to be alerted when the count of stocks that meet your scan conditions is more than 2, 3 or so on.. By default this is set to 0, so you will be alerted even when a single new stock is found in your Scan. You could continue the alert after the trigger is met or pause it. All alerts created can viewed on the Alerts Dashboard. 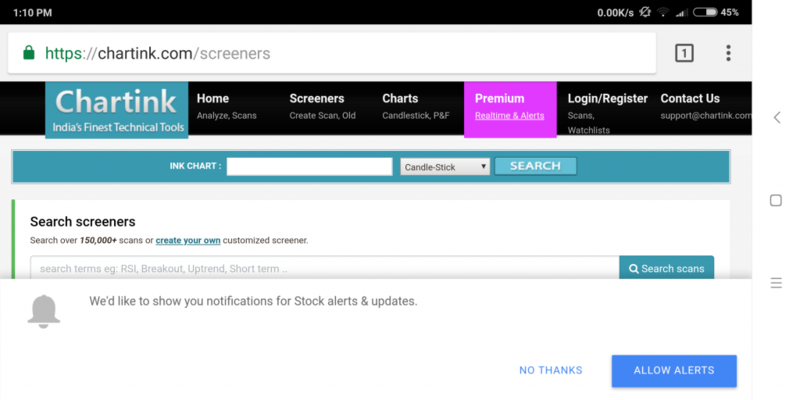 Triggers indicate when alerts for screeners were triggered & new stocks were filtered in your scan. Alert triggers indicate when notifications were sent via your email or sms. Clicking any of the alerts on the Alerts Dashboard would take you to the alert triggers page. New stocks filtered for a given alert in a day are highlighted and notifications are sent ONLY when a alert finds stocks that were not alerted in its previous run. Kindly refer our FAQs for alerts here. Feel free to reach us at support@chartink.com for any doubts. 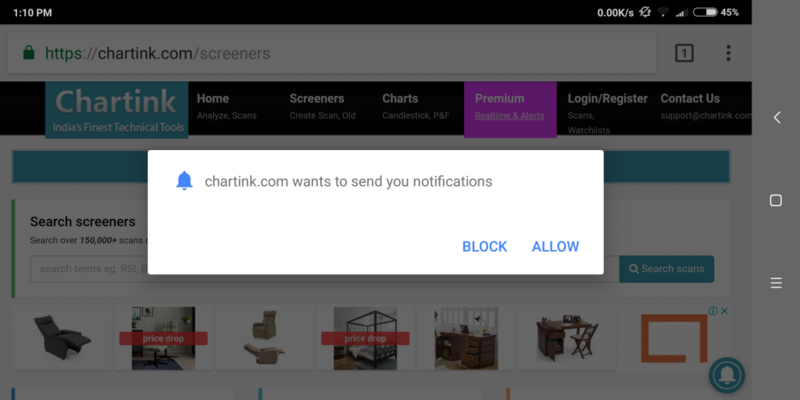 We’ve created a step-by-step guide on how to create alerts across any screener. How many stocks are scanned for alerts? We default to running scans for all NSE stocks, unless you change a scan to run for a watchlist, nifty 50, nifty 100. 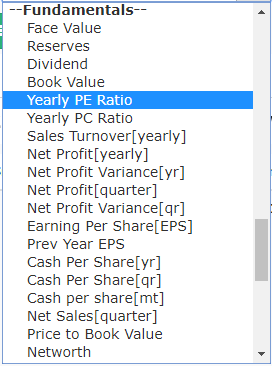 The number of stocks scanned for are dependent on the scan definition. When are intraday, daily, weekly and monthly alerts run? Intraday – A alert for 5 minute starts running at 9:20am considering the latest data as of 9:19:59am, next run would be at 9:25am. A 15 minute alerts starts running at 9:30am(data as of 9:29:59am), next run wold be at 9:45am and so on..
Market open – Runs at 9:20am considering the latest data as of 9:19:59am. Whether THE alerts ARE live[ real time ]? Yes, our scans runs on the latest live data available, eg: If you have configured to run a scan every 5 minutes, the first scan would be at 9:20am, which will be based on the data as of 9:19:59am. As we process dozens of scans for every user throughout the day, there could be a delay upto 1 minute while you are notified. How frequently would I be notified for alerts? We send our alert notifications based on alert configuration. If you’ve set a alert to run every hour, it shall run at 9:20am, 10:20am, 11:20am.. We send you notifications ONLY when we find new stocks the scans to avoid spamming your sms/mail box. how many alerts i shall receive? We provide a total of 2,000 sms & email credits in a month, which are used while sending alerts. These allows you to receive more than 90+ alerts per day. Notifications credits(sms & email) will be used at a alert level and independent on the number of stocks filtered in a scan. If a alert notifies you about 50 stocks, it will use a single notification credit. What happens when your NOTIFICATION credits finish? You can purchase additional SMS or Email credits. Visit your subscription dashboard to do so. HOW DO WE SEE ALl THE ALERTS CONFIGURED? Do you provide the scanners or subscriber has to can use his own scanners. You can add alerts on any of the 1,50,000+ screeners‘ available on the site or create your own. IS THERE FREE Trial AVAILABLE?